Dell’s most unique, stylish, and conscientious desktop PC. Designed to fit into your environment while protecting the environment. More flexible than a typical PC, the Dell Studio Hybrid is an anywhere-you-want-it-desktop. Our smallest desktop, it looks great in the living room, on the desk, or anywhere else space is at a premium. Plus, it uses energy-efficient Intel® Core™2 Duo Mobile Processors, so you can enjoy its power while helping to preserve the planet. Go green without cramping your style. The Dell Studio Hybrid makes personalization easy – choose from a variety of colors or one of several premium sleeves, including leather. Now the only problem you face is picking out which color is right for you. Small, sleek, and muscular using advanced mobile technology from Intel. The Dell Studio Hybrid packs big performance, high efficiency and the brains to back it up. With an optional digital/analog TV tuner, you are able to watch, pause and record live TV*. Simply insert your CD or DVD into the optical drive to burn files, music and movies. Add an optional Blu-ray DiscTM player and watch high-definition movies. Keep your work area clean with an optional wireless mouse and keyboard letting you move around without restriction. You even have the option of a WiFi® network to give you flexibility of setting up your PC anywhere in your home. What will you do with all that freedom? 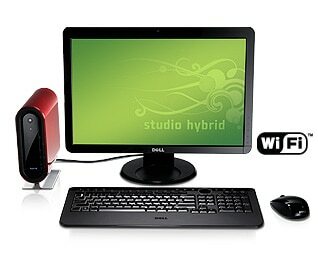 Dell Studio Hybrid is Dell’s greenest consumer desktop PC. Our smallest design is about 80% smaller than standard desktops, and it contains about 75% less printed documentation by weight when compared to typical tower desktops. Uses about 70% less power than a typical desktop, and meets Energy Star® 5.0 standards with an 87% efficient power supply. 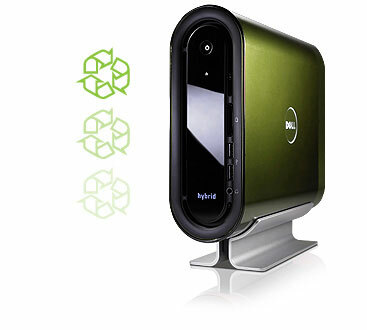 Dell Studio Hybrid packaging is made from 95% recyclable materials. 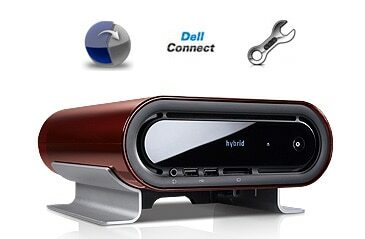 And the Dell Studio Hybrid comes with a system-recycling kit, so you can help preserve and protect the environment. Our centrally located, easy-to-use application provides personalized support resources. Conveniently located on your PCs desktop with quick links to service, support and system resources. Helps keep your system up-to-date and running efficiently through automated fixes for common configuration issues. Simplifies troubleshooting and repair by enabling a Dell service associate to access, diagnose and support customers over the Internet. Start enjoying your favorite music and movies as soon as you get your new Dell. Financing offered by WebBank to qualified U.S. residents. Taxes and shipping charges are extra and vary. Minimum monthly payment is greater of $15 or 3% of your account balance.